For other uses, see Passenger (disambiguation). A passenger (also abbreviated as pax) is a living being who travels in a vehicle but bears little or no responsibility for the tasks required for that vehicle to arrive at its destination or otherwise operate the vehicle. 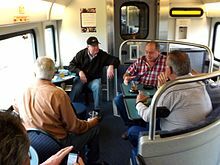 Passengers are living beings who ride on buses, passenger trains, airliners, ships, ferryboats, and other methods of transportation. Historically, the concept of the passenger has existed for as long as man has been able to create means of transportation capable of carrying more people than were needed to operate the vessel. Crew members (if any), as well as the driver or pilot of the vehicle, are usually not considered to be passengers. For example, a flight attendant on an airline would not be considered a passenger while on duty and the same with those working in the kitchen or restaurant onboard a ship as well as cleaning staff, but an employee riding in a company car being driven by another person would be considered a passenger, even if the car was being driven on company business. Express passenger, which constitutes long distance and high speed railway travel between major locations such as ports and cities. Semi-fast express passenger, a type of service that is high speed, though stops at selected destinations of high population density en route. Local passenger, the lowest category of British passenger train, which provides a service that stops at all stations between major destinations, for the benefit of local populations. In transportation, a "no pax" trip is a trip without passengers. For example, no-pax flights are freight, ferry and positioning flights. A revenue passenger is someone who has paid a transport operator for her or his trip. That excludes non-paying passengers such as airline employees flying on free or nearly-free passes, babies and children who do not have a seat of their own, etc. However, passengers who paid for their trip with a frequent-flyer program mileage award are usually included. This term is used in the transportation industry, in particular in traffic measures such as revenue passenger kilometer (RPK) and revenue passenger mile (RPM). Revenue passenger miles (RPMs) and revenue passenger kilometers (RPKs) are measures of traffic for an airline flight, bus, or train calculated by multiplying the number of revenue-paying passengers aboard the vehicle by the distance traveled. On long-distance buses and trains (and some planes), passengers may board and disembark at intermediate stops, in which case RPMs/RPKs have to be calculated for each segment if a careful total is needed. Revenue passenger miles can be considered the basic amount of "production" that an airline creates. The revenue passenger miles can be compared to the available seat miles over an airline's system to determine the overall passenger load factor. These measurements can further be used to measure unit revenues and unit costs. ^ "Define Pax". Travel Industry dictionary. Retrieved 5 January 2014. ^ "Lady Slipper Aviation Safety Plan". BLM and USFS. Retrieved 5 January 2014. ^ Burin, Jim. "Approach and Landing Accident Reduction". Flight Safety Foundation. Retrieved 5 January 2014. ^ William Statsky, Essentials of Torts (2011), p.339. ^ Lee Jr., Lawrence: Railway economics and passenger sociology (Oxford: Oxford University Press, 1992). ^ "Airline Data Project: Glossary". Massachusetts Institute of Technology Global Airline Industry Program. Retrieved March 15, 2013. ^ "Basic Measurements in the Airline Business". American Airlines. Archived from the original on 2013-04-10. Retrieved 2013-03-20. ^ "Airline Data Project: Traffic and Capacity by Operating Region". Massachusetts Institute of Technology Global Airline Industry Program. Retrieved 2013-03-20. Look up passenger in Wiktionary, the free dictionary.